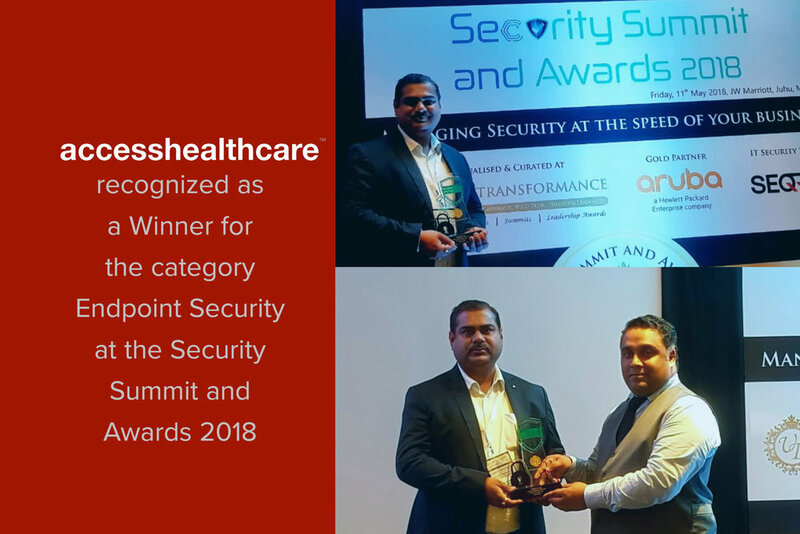 Access Healthcare Recognized as a Winner for the “Endpoint Security” at the Security Summit and Awards 2018. Access Healthcare named as a Winner for its Endpoint Security by UBS Transformance on May 11, 2018, at the Security Summit and Awards 2018. Access Healthcare received this recognition for providing comprehensive and simplified endpoint security management that helps us to proactively monitor and protect a wide-range of endpoint network points from security threats across multiple delivery centers through a centralized solution. We believe a comprehensive security architecture is not just how we manage a security attack, it's about protecting the network infrastructure from potential threats that guarantee 100% security and privacy to our patient’s information. Security Summit and Awards 2018 is a premier annual gathering of extremely senior delegates, which would ensure exchange of ideas and opinions among various influential stakeholders focusing on Managing Security at the speed of your business. Ramesh Ramachandran, Senior Director and Site Head - Pune for Access Healthcare, received the award on behalf of the company at the event held on 11 May 2018 at JW Marriott, Mumbai.